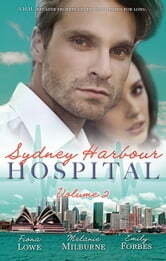 Sydney Harbour Hospital: From saving lives to sizzling seduction, these doctors are the very best! Surgical registrar Hayley Grey knows all the gossip about renowned former head of neurosurgery Tom Jordan –he lived for his job, shunned relationships and two years ago he disappeared. Now he's back and his secret is out. Tom's blind and will never operate again. No wonder he's the proudest, rudest, man she's ever met – but that doesn't stop her being drawn to his powerful charisma! Stylish heiress Lexi Lockhart has it all… but beneath her glossy façade she longs to be taken seriously - especially by head transplant surgeon Sam Bailey. Their fiery attraction is as red-hot as the day he walked away. But even if Lexi gives into temptation, will Sam still want her when he discovers this socialite's deepest secret? Confined to her hospital bed, the only thing keeping shy Bella's vital signs in check (and giving her hope for the future) are the regular visits from Charlie Maxwell, SHH's most charming doc. Charlie's no stranger to crushed dreams but Bella's living on borrowed time. Suddenly, making Bella's deepest wishes come true is Charlie's only priority!